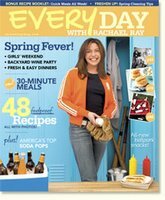 According to MSN Money, Rachael Ray's new magazine, Every Day with Rachael Ray, has "continued to surpass internal growth expectations." 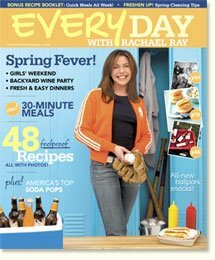 If they wanted to know how Rachael Ray's magazine was going to do, they should have just asked me. I would have told them that there was nothing else on the market that was anything like it and that those of us who do not have the time or inclination to be like Martha Stewart would eat the thing up! The magazine is just so darn full of practical stuff that I can't help but love it. If you haven't already, try the Gaucho Cheesesteaks or the Super-Size Turkey Meatballs with Spinach and Cheese for good examples of the recipes this magazine has to offer.